Our next Life Drawing Workshop is Monday 3rd October. Please bring your own materials and drawing boards etc and contact me to book a place and for directions if you haven't been here before. We have had an incredibly busy summer at Honeycomb Studios with preparation for DOS and a 2 day Children's Animation Workshop in August. 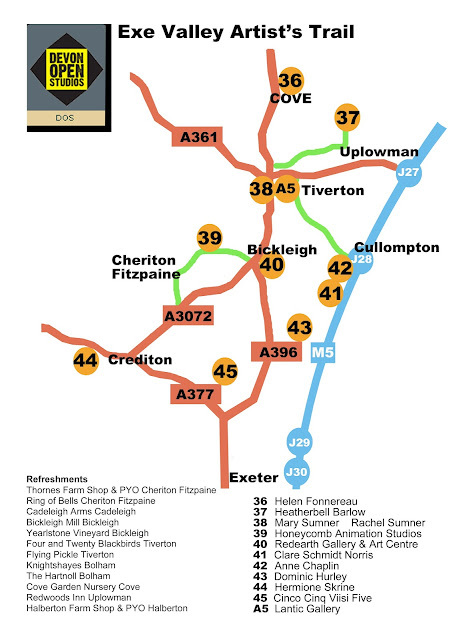 Our Open Studios Exhibition was highly successful and we had a good number of Visitor's despite the awful weather. We were also delighted to have made a healthy number of sales of painting and prints. The Exhibition also included original animation set ups from some of our productions including Grizzly Tales, Wolves Witches and Giants and Funky Valley and Funky Town. We also had on display the original 3D set up from Grizzly Tales and kids had an opportunity to have a go at animation themselves. 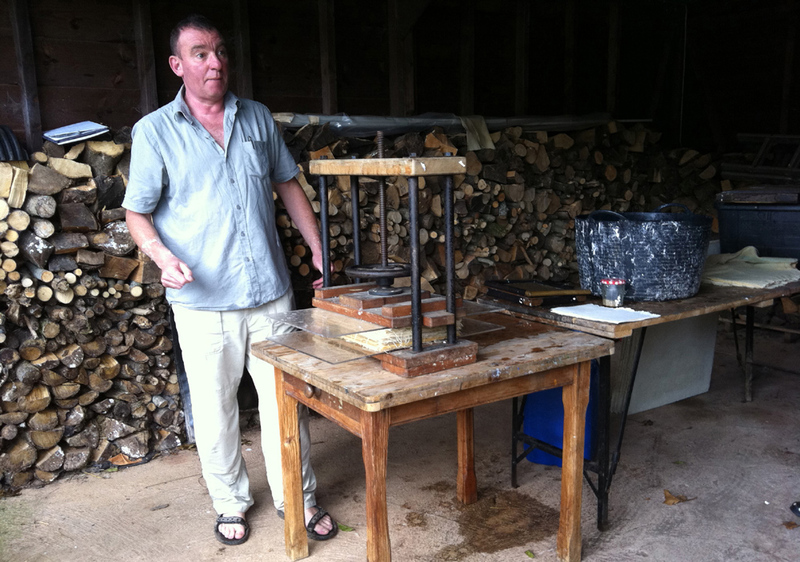 We ran 3 very successful workshops during Open Studios, the first was Paper Making with Neil from Two Rivers Handmade Papers. Neil is a fantastic teacher, interesting and informative and he gave us a background to the process and origins. We had the opportunity to make several A4 sheets of paper using wood pulp, cotton rag and linen. 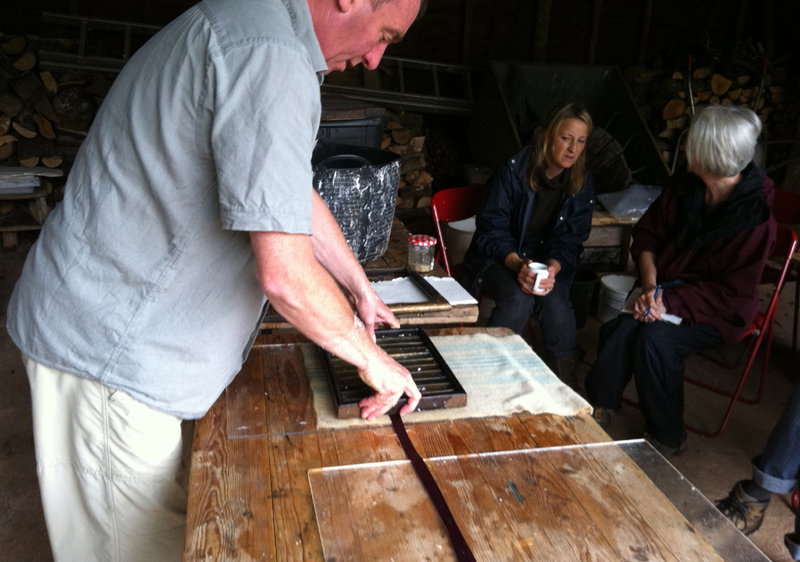 We all got the paper making bug and have ordered moulds and deckles from Neil. We propose to run another workshop at the Paper Mill itself to enable us to produce larger sheets. Laurie Steen's Intuitive Drawing Workshop was amazing, despite the clouds and showers we managed to find a few breaks in the weather to shadow draw outside. However with spotlights and large branches dragged into the studio we created our own shadows and produced huge group wall and floor drawings and individual scrolls with large chunks of charcoal. Everyone was energised by the experience and its definitely a workshop we will repeat. 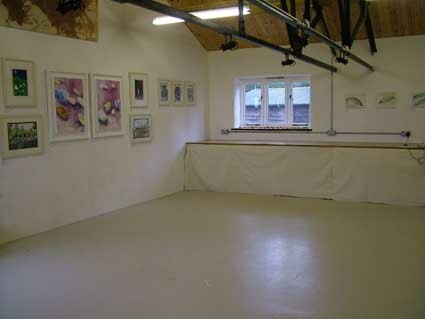 On yet another very wet day Ashley Hanson ran his fantastic Freedom in Painting workshop. We started with the fundamentals of colour mixing using complimentary colours and we continued by working directly onto canvas using a series of methods of applying the paint, including brushes, palette knives, hands etc, learning how to layer the paint and examining how colours work together producing different effects. It was extremely informative and everyone got a lot out of it. 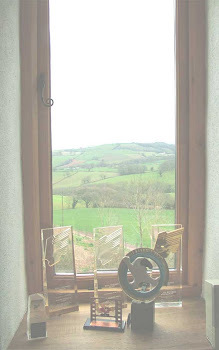 Ashley runs his own workshops in Cornwall and 2012 he will be running 2 Painting Holidays. However he will be back at Honeycomb Studios. We are now planning our next batch of workshops, we have had quite a demand for an adult Animation Workshop and we hope to run this in November. If there is enough interest we will run one on a weekday and another one on a Saturday so that no one misses out. This would be an introduction to 2D animation and will include traditional drawn animation and some Flash animation. We will need a minimum of 8 people for each workshop. So please get in touch if you are interested. The two day animation workshop at Honeycomb was a great success. Here's the fantastic result. Thanks to all the children who worked so hard on their films.